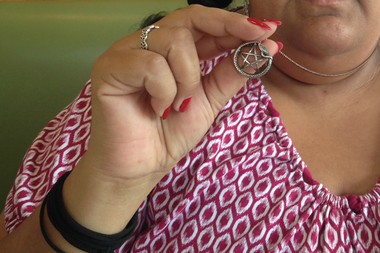 BRIDGEPORT — Laura Gonzalez’s job title might scare you: Witch for hire. Officially, Gonzalez follows a religion called Wicca, a form of paganism that’s snowballed in popularity since the "flower power" movement of the late '60s. As organizer of a group called Center of the Elemental Spirit: A Congregational Wiccan Community, she now will host a Wiccan gathering twice a month in Bridgeport, celebrating two lunar phases: the waxing and waning moons. “We believe the Earth is sacred,” Gonzalez said. "We're anti one thing: We're anti harming people." The stigma around Wicca might have you believe witches are evil beings. While Wiccans often practice “magick” or witchcraft, true followers are against anything that might cause harm. Wiccans believe magick is a way to control one’s destiny and make dreams come true by asking the universe for help. Common wishes might include finding a good job or health. The religion’s critics often confuse Wicca with Satanism because of the pentacle, a Wiccan symbol that includes a five-pointed star inside a circle. The Satanic Church has the pentagram, which also includes a five-pointed star. Four of the points of the pentacle represent the elements of nature: earth, air, fire and water. The fifth point marks the spirit and the circle stands for the eternal circle of life. Gonzalez welcomes anyone interested in Wicca to attend a gathering at a Bridgeport yoga studio. The group welcomes practitioners from all walks of life. Buddhists and devout Christians have attended rituals with the Center of the Elemental Spirit. Those who are unsure of their religion, exploring their options, are called "seekers." • Each gathering is paired with a topic attendees use to develop a “co-created sermon” — an open discussion. The topic assigned to the groups first meeting was “Bringing Magick to our lives.” People are encouraged to share ideas about the topic and ask questions. • Attendees are given time for a short break while the center sets up the ritual space. • Then it’s time for the ritual, which, according to Gonzalez, is best to experience first hand. During the ritual, the Center’s organizers explain what is happening, step by step, and guests are welcome to ask questions as they explore the religion. The ritual is performed to raise energy to achieve personal goals of the group. The next South Side ritual — themed “Spirituality in Community” — will take place from 7-9 p.m. Sunday. To RSVP, click here.